Nintendo President Satoru Iwata says there's no way he's going to allow the company's properties to be shared with rival game consoles. Nintendo hasn't exactly set the world on fire with the Wii U and there are some folks who think that the best way for Nintendo to get its mojo back is to start releasing its games on every platform under the sun. People like Eidos President-For-Life Ian Livingstone, for instance, who said in June that "a whole generation of young people will miss out on their games" if Nintendo keeps its IP exclusive to its own platforms. But don't hold your breath waiting for it to happen, because Iwata believes that while it might give the company a short-term boost, it's a bad idea for the long haul. "If I was to take responsibility for the company for just the next one or two years, and if I was not concerned about the long-term future of Nintendo at all, it might make sense for us to provide our important franchises for other platforms, and then we might be able to gain some short-term profit," he told CVG. 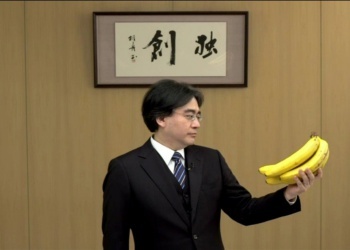 "Never" is about as unambiguous as it gets, but Iwata did acknowledge that Nintendo is "facing more challenges than ever," even as he insisted that it's really nothing new for the company. "Nintendo is a company that has never stopped progressing, and when it comes to the fan-base, of course, we have to sustain that," he said, "but we are always trying to expand that." Nintendo is still selling the Wii U console at a loss, but in the good news department the company reported increased profits for the first quarter of its fiscal year, and its stock price hit a two-year high in July.